'World's rarest album' goes up for auction: John Lennon's personal copy of the . Beatles Radio: The Beatles, Solos, Covers, Birthdays, News The Fab 4 and More! It will go under the hammer on November 11 in Dallas, TX, with a $200k estimate. John Lennon's personal copy of a Beatles album with hand-drawn sketches dubbed the world's rarest album is set to fetch more than $200,000 as it goes up for auction. It was John Lennon's personal copy and sports one of his illustrations on the back of a man with his shovel and a dog in front of a setting sun. 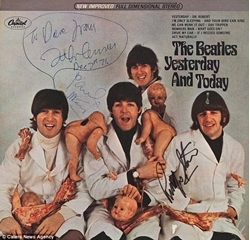 The Yesterday and Today prototype was pulled two days after its release because of the controversial cover artwork and all were destroyed apart from a few - including this one owned by Lennon himself - before a tamer version was hurriedly re-released.